A large asteroid in space that has a remote chance ofslamming into the Earth would be most likely hit in 2182, if itcrashed into our planet at all, a new study suggests. The asteroid, called 1999 RQ36, has about a 1-in-1,000chance of actually hittingthe Earth, but half of that risk corresponds to potential impactsin the year 2182, said study co-author Mar?a Eugenia Sansaturio of theUniversidad de Valladolid in Spain. Sansaturio and her colleagues used mathematical models todetermine the risk of asteroid 1999 RQ36 impacting the Earth through the year2200. They found two potential opportunities for the asteroid to hit Earth in2182. The research is detailed in the science journal Icarus. 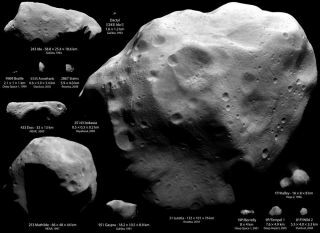 The asteroid was discovered in 1999 and is about 1,837feet (560 meters) across. A space rock this size could cause widespread devastationat an impact site in the remote chance that it hit Earth, according to a recentreport by the National Academy of Sciences. Scientists have tracked asteroid 1999 RQ36's orbitthrough 290 optical observations and 13 radar surveys, but there is still someuncertainty because of the gentle push it receives from the so-called Yarkovskyeffect, researchers said. The Yarkovsky effect, named after the Russian engineerI.O. Yarkovsky who proposed it around 1900, describes how an asteroid gainsmomentum from thermal radiation that it emits from its night side. Overhundreds of years, the effect's influence on an asteroid's orbit could besubstantial. ?Sansaturio and her colleagues found that through 2060,the chancesof Earth impacts from 1999 RQ36 are remote, but the oddsincrease by a magnitude of four by 2080 as the asteroid's orbit brings itcloser to the Earth. The odds of impact then dip as the asteroid would moveaway, and rise in 2162 and 2182, when it swings back near Earth, theresearchers found. It's a tricky orbital dance that makes it difficult to pindown the odds of impact, they said. "Theconsequence of this complex dynamic is not just the likelihood of acomparatively large impact, but also that a realistic deflection procedure(path deviation) could only be made before the impact in 2080, and more easily,before 2060," Sansaturio said in a statement. After 2080, she added, it would be more difficult to deflectthe asteroid. "If this object had been discovered after 2080, thedeflection would require a technology that is not currently available,"Sansaturio said. "Therefore, this example suggests that impact monitoring,which up to date does not cover more than 80 or 100 years, may need to encompassmore than one century." By expanding the timeframe for potential impacts,researchers would potentially identify the most threateningspace rocks with enough time to mount deflectioncampaigns that are both technologically and financially feasible, Sansaturiosaid.